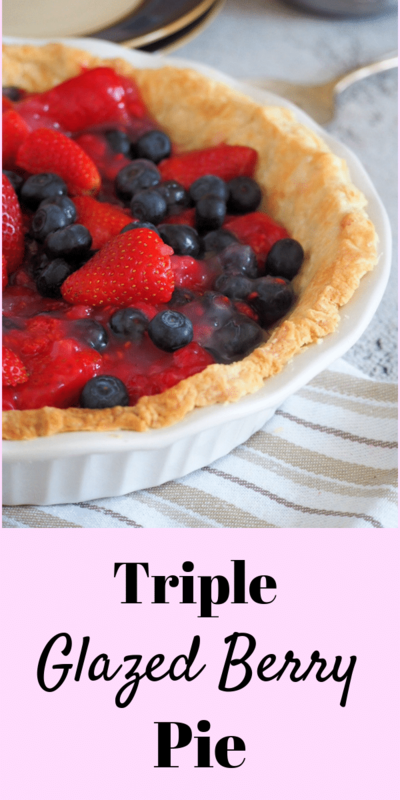 This Glazed Triple Berry Pie is a delightful mixture of juicy berries, sweetened with fruit glaze and nestled in a sweet cream cheese filling on a buttery crisp pie crust. Spring is my happy season. That is when the earth is starting to show underneath a pile of melting snow, the air starting to warm up and the days are brighter. When it comes to baking, I get to incorporate more colors into goodies. Specifically, berries. And I just love how sweet and nice they are this time of the year. 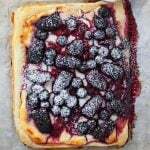 And I especially love them in this Glazed Triple Berry Pie. 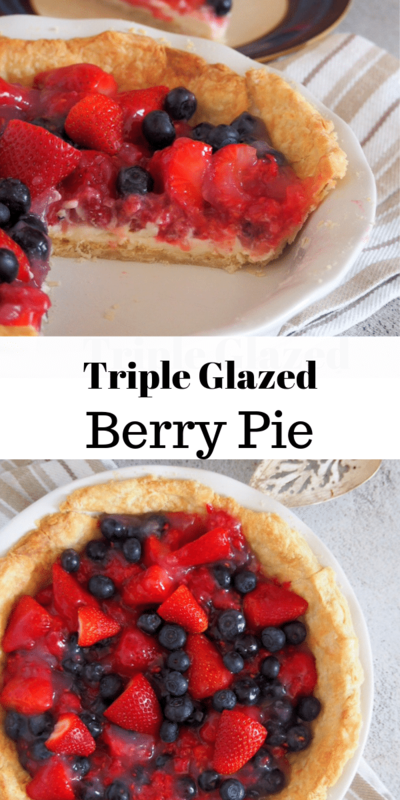 What is in a Glazed Triple Berry Pie? A delicious mix of fresh blueberries, raspberries, and strawberries glazed with a smooth and sweet fruit concentrate. 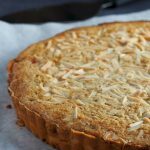 Sweetened cream cheese spread on the base of the crust. Finally, everything is nestled on a buttery pie crust. 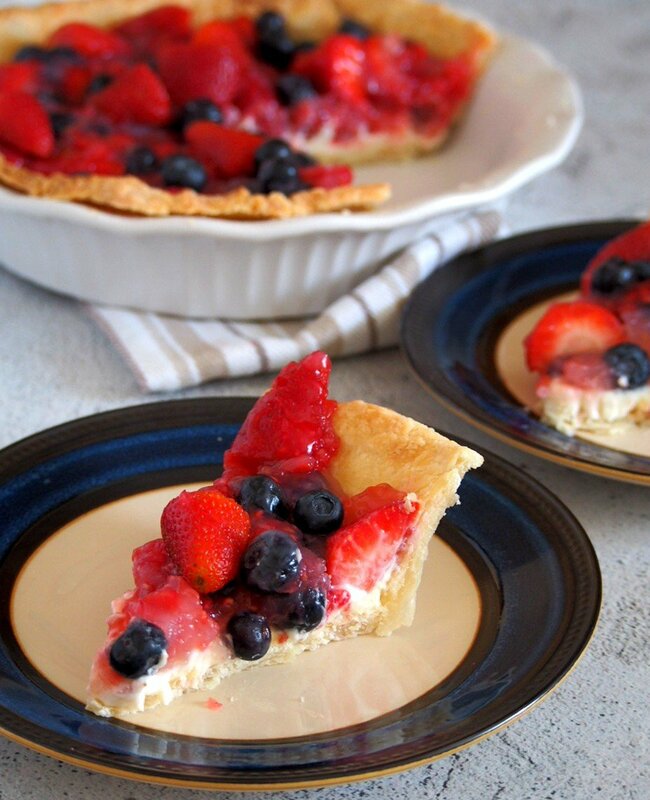 Delicious of layers of crust, cream cheese and berries in a delightful summer/spring dessert. Yum! Whisk together flour and salt in a large bowl. Add in diced pieces of butter. 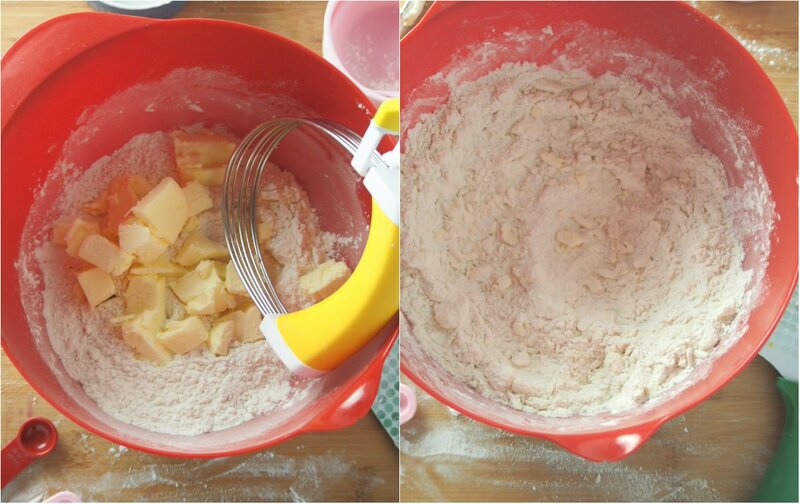 Use a pastry cutter to cut the butter pieces into the flour mixture. You should end up with a mixture that looks like a coarse meal. Add the cold water, and stir it in until the powders are well moistened. The dough should cling together when pressed with your fingers. Turn the dough out on a lightly floured board, knead it briefly just to gather it in one mass. Shape it into a disc and wrap it in plastic. Chill in the fridge for 4 hours to overnight. After chilling, let the dough rest for 7-10 minutes in the counter. You want it to be just a little pliable and not too hard for the rolling. On a floured board, roll it out to a rough circle that is 1/4 inch thick. To lift the dough and place it in the pie pan, gently wrap the dough around the rolling pin, lift it over the pie pan and gently lower it. Fit it along the edges of the pan. Trim the excess dough, fold over the edges and make crimps on the dough edges using your fingers. Chill the assembled pie crust in the fridge for an hour or so. After that, your pie crust is ready. But first we need to blind bake it first, that is bake it without any filling. 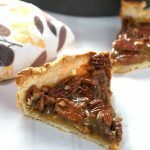 How to Blind bake Pie Crust? 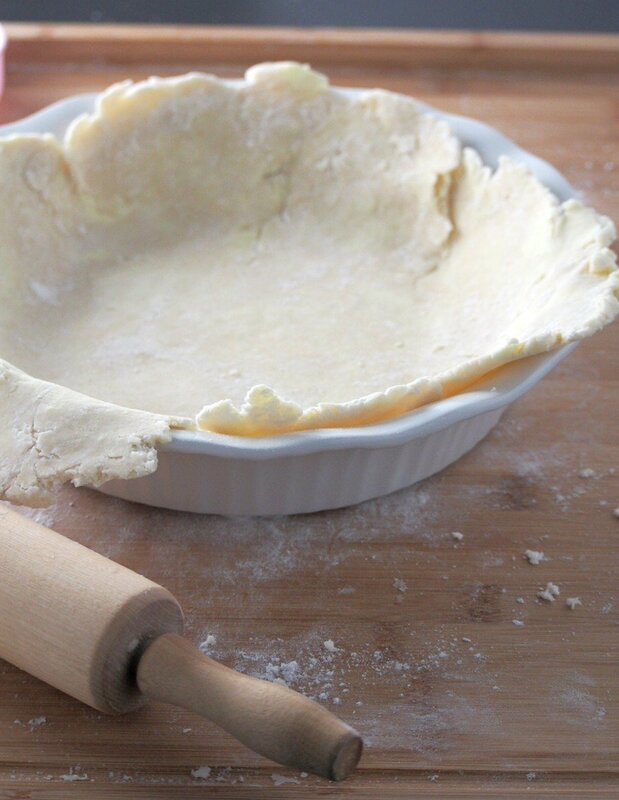 We blind bake pie crust if the filling does not need any baking or if the filling cooks faster than the crust. In this case, the filling is ready to go and does not need to be baked along with the crust. To set up, cut a piece of parchment paper big enough to cover the pie crust. Place it over the crust and fit it along the edges. Place some uncooked rice or beans to serve as weights over the parchment. 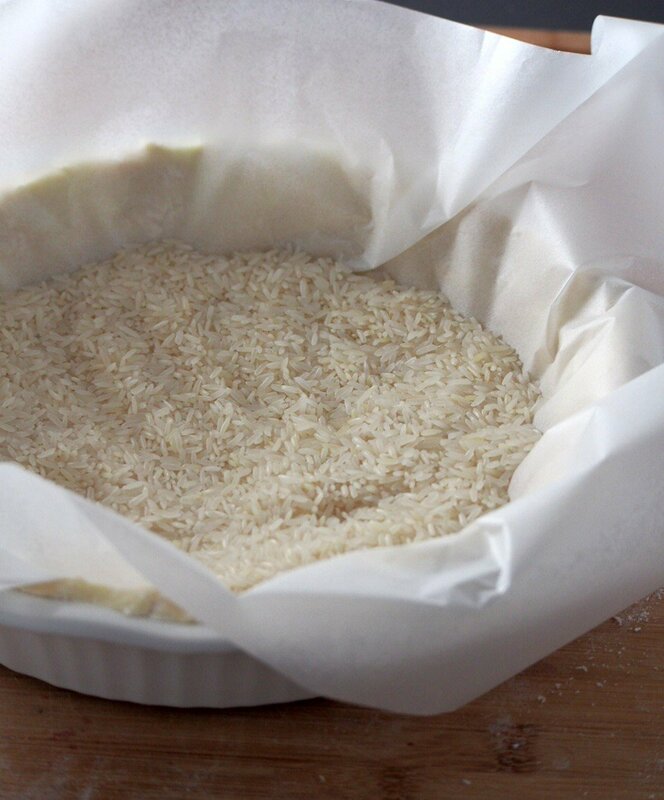 Bake the crust on a 400F preheated oven for 15 minutes, then remove the parchment and the rice. Poke holes all over the crust using the tines of a fork. Return to the oven and bake for 5-10 minutes more, or until the crust is golden. Let the crust cool completely. Once cool, spread the cream cheese filling on the bottom of the crust. 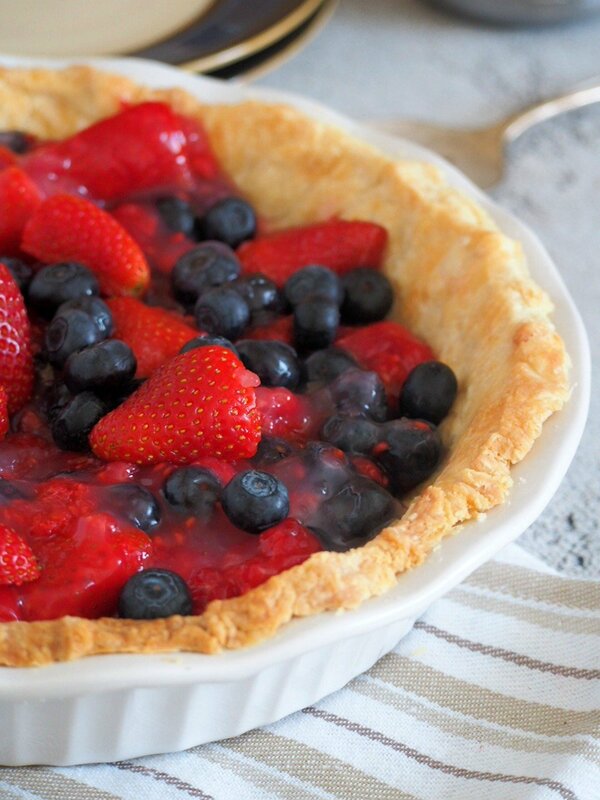 Then make the glazed berries. To make them, whisk together cornstarch and sugar in a medium saucepan. Gently stir in the fruit concentrate and water until smooth. Bring this mixture to a boil over medium heat, stirring constantly. The mixture will thicken as it boils. Once it is smooth and thick, turn off heat and let it cool. Fold over the berries. 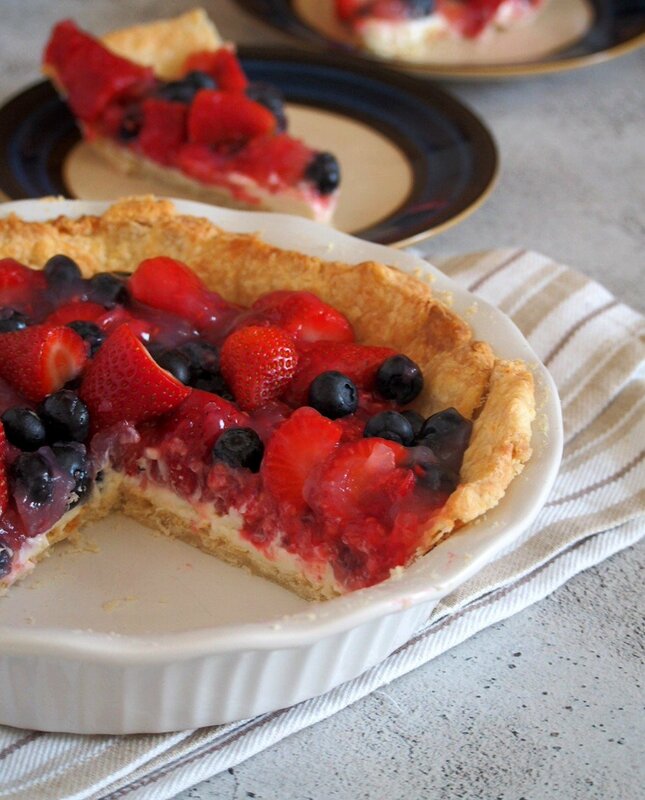 Spoon the berries over the cream cheese filling. Almost done and you can actually eat the pie now! But if you have more patience, pop it in the fridge just to chill. And here you have it! A nice, fresh and bright dessert. 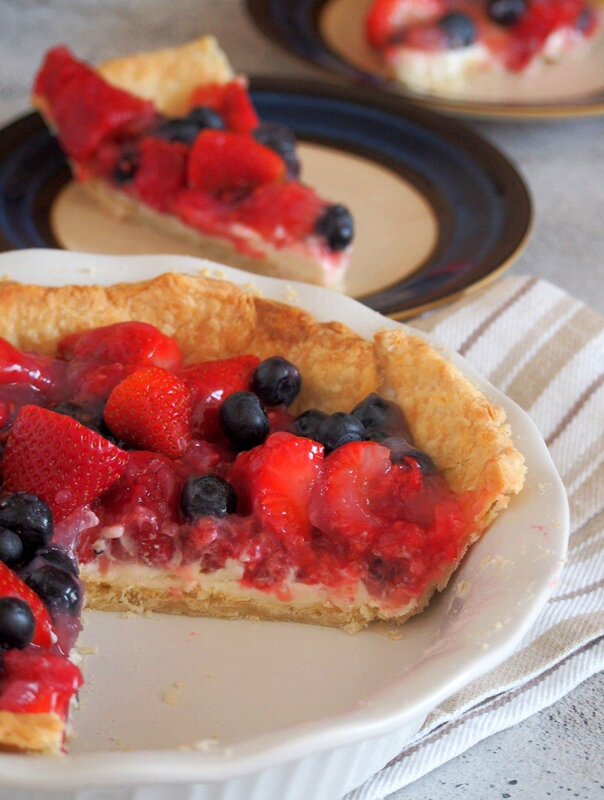 I love the cheerful colors and the pop of sweetness in every slice. I can’t be more excited for a lovely summer season this year. Camping, hot days and lots of outdoor things coming soon. And the summer desserts, of course! If you are unsure of what a fruit concentrate is, it is the ones like this. They are in the frozen aisle. Thaw first before measuring out. 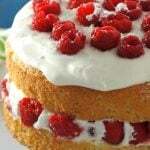 I used strawberry/passion fruit blend. You can use any flavor you prefer, just not the citrus ones. 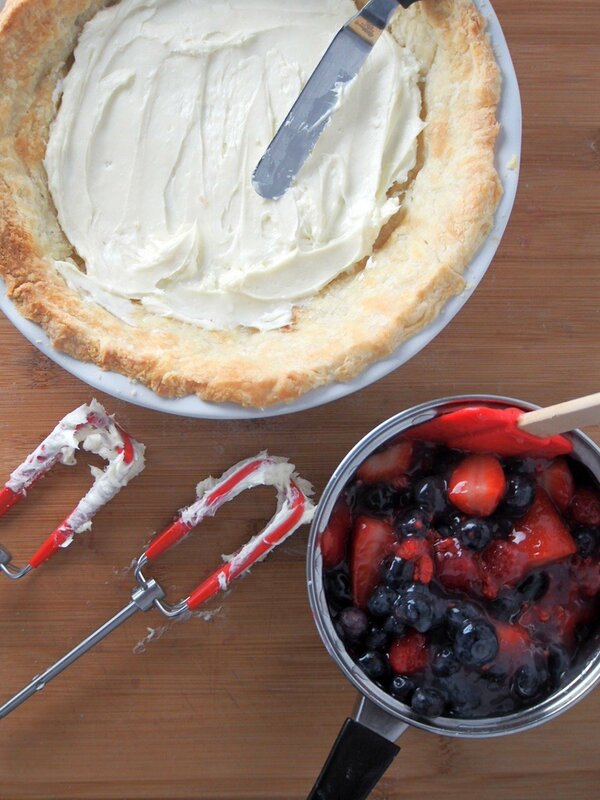 The recipe calls for a 9-inch pie pan for the pie crust. 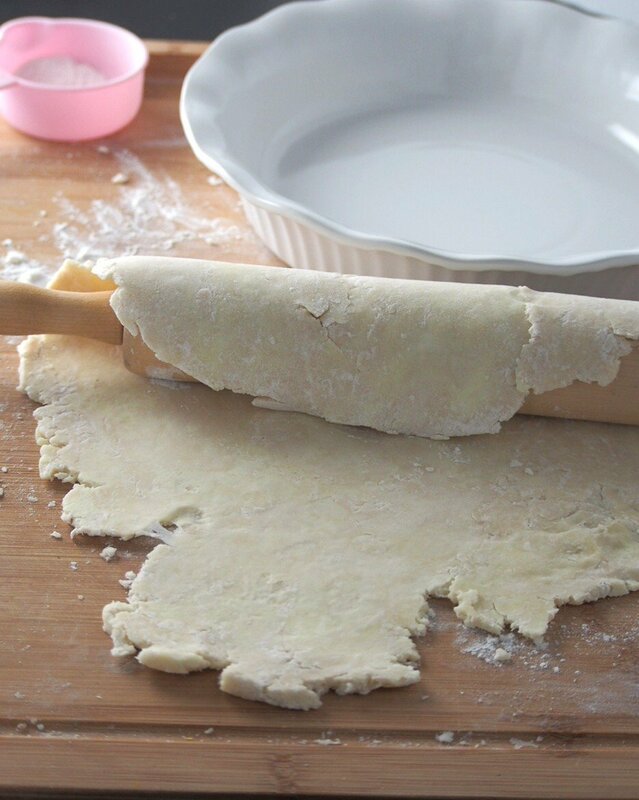 A pastry cutter is best to cut in the butter into the flour mixture. The pie is best served the same day but will keep in the fridge for up to two days. 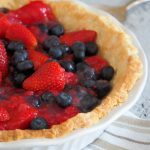 This Glazed Triple Berry Pie is a delightful mixture of juicy berries, sweetened with fruit glaze and nestled in a buttery crisp pie crust. 3 cups combined fresh berries (raspberries, blueberries and strawberries) Washed and dried. The strawberries, hulled and chopped. In a mixing bowl, combine flour and salt. Whisk together. Add in the cubed butter pieces. Use a pastry cutter to cut the butter into the flour mixture until the texture looks like a coarse meal, with some bits of butter left. Add the cold water and stir it in until the powders are moistened and the dough clings together when pressed with your fingers. Turn the dough over on a lightly floured board. Knead it briefly just together the dough into a mass. Shape into a disc and wrap it in plastic. Chill in the fridge for 4 hours to overnight. Let the dough rest at room temperature for about ten minutes. On a lightly floured board, roll it out to a rough circle of about 1/4 inch thickness. Gently lift the dough by wrapping it around the rolling pin. Place it over a 9-inch pie pan. Trim the excess, fold over the edges and make crimps with your fingers. Chill this for about an hour in the fridge. Preheat oven to 400 F. Cut a piece of parchment paper big enough to cover the pie crust. Place it over the crust and fit it along the edges. Place some uncooked rice on the parchment paper. 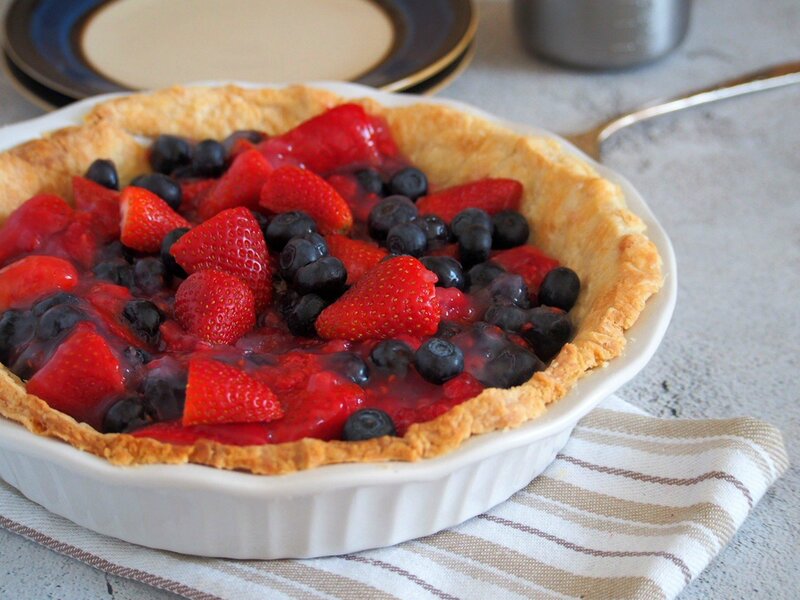 Position the pie pan in a baking pan and bake it in the oven for 15 minutes. Remove the parchment paper and the rice. Poke holes all over the crust using the tines of a fork. Return to the oven and bake for 5-10 minutes more or until the crust is golden. Let cool. Beat together cream cheese, sugar and vanilla extract until smooth. Spoon into the cooled crust and smooth it out evenly with a spatula. In a small saucepan, whisk together cornstarch and sugar. Gradually stir in fruit concentrate and water until the mixture is smooth. Bring this to a boil over medium heat, stirring constantly. Once the mixture is thick and smooth, turn off heat and let the glaze cool. 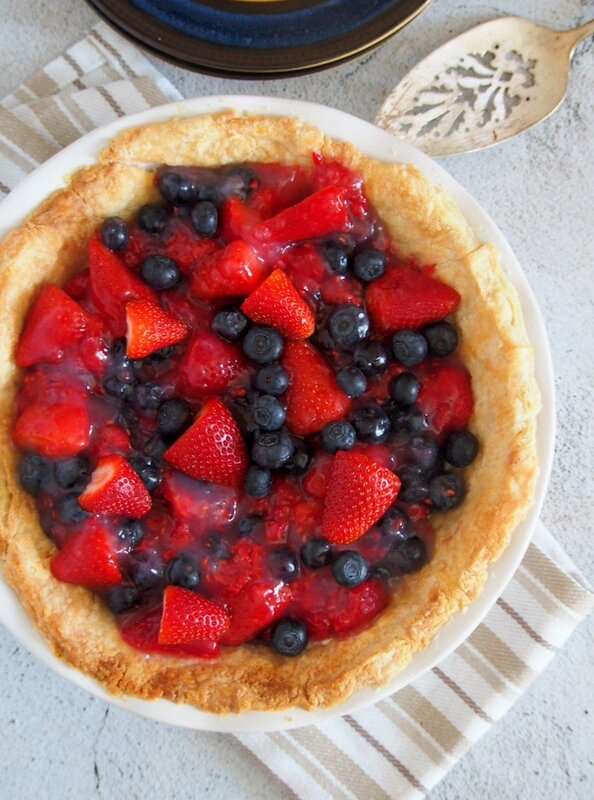 Fold in the berries. Spoon the entire mixture over the cream cheese in the pie crust. Chill in the fridge and serve. 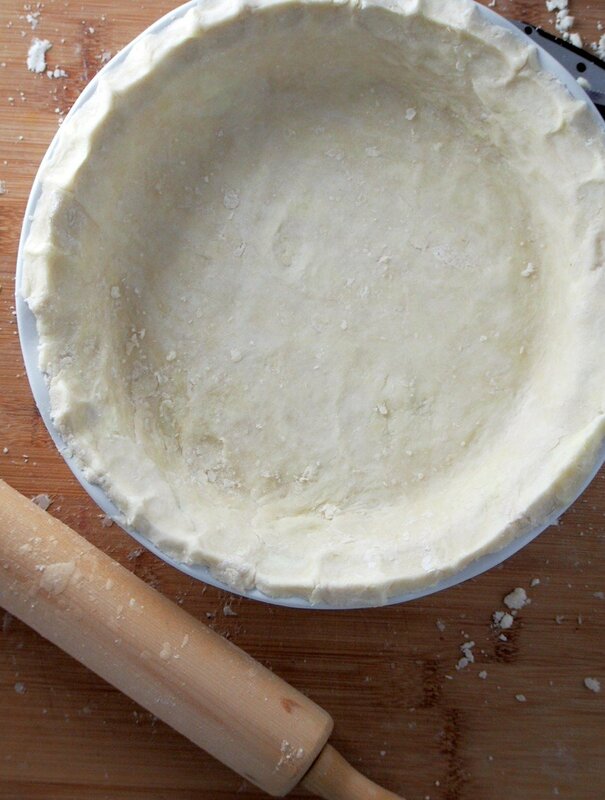 Pie crust recipe from All Recipes.